A few weeks ago I found some awesome metal skeleton keys at my local thrift store. They were larger and metal so I knew that I had to have them, just not sure what the project was going to be. This past weekend, I finally used them and turned them into a fun wind-chime. 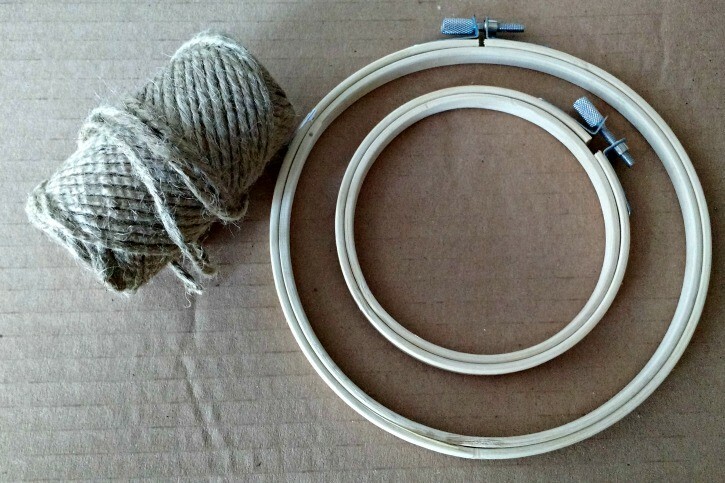 The first step is to wrap both of the embroidery hoops in the jute twine. About every 10 wraps I would add a dot of glue to help hold it in place over time. Once they are all wrapped, I tied the center hoop to the larger hoop in 4 places using the same twine. This project is supposed to look rough so it doesn’t need to be exact or completely straight. Tie the keys to the hoops. I had an odd number so I put one in the center as well and then used that as part of my hanging apparatus. Right after I hung this up outside we had a bit of a storm roll through and it was great hearing these keys clang together. I love the combination of all the different keys. There are two different colors and multiple sizes on the one wind-chime. 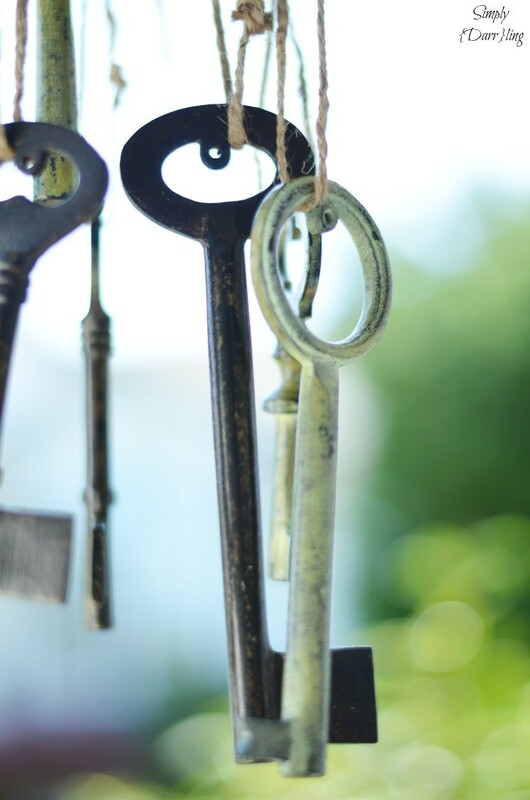 If you found some great skeleton keys at the thrift store what would you do with them? Love the look of this – – I wish I was more creative! Such a cool, rustic idea! I like it! OMG, I love this! What a great idea! aw this is so cute! I’m definitely going to make this. 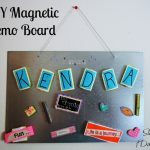 KENDRA, this is so cool! What a unique idea! OH EM GEEE! I need this in my life for real. We live across the street from the water and the wind is always crazy here. What a great idea. I would never have thought to do this with the keys. I love old keys too but I am not sure i would be this creative with them. I would probably just frame them or something. 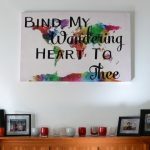 Thanks for sharing at the Thursday Favorite Things Blog Hop! I absolutely love the sound of a wind chime. So so pretty! Thank you so much for linking up! 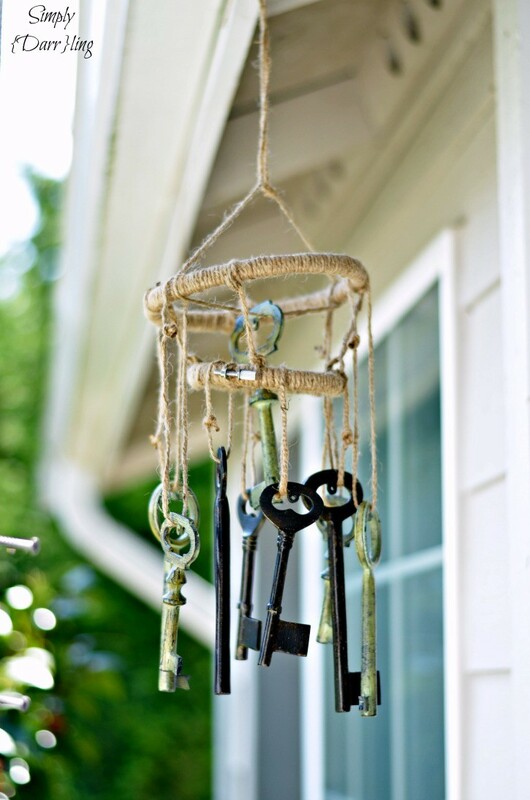 These old keys are really neat and how creative to make a wind chime out of them! Love! This is a cute Idea! Sharing! 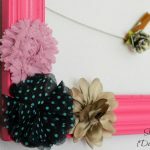 Super cute diy! Perfect for spring & summer. Thanks for sharing at the Inspiration Spotlight Party. Pinned & shared. Hope to see you again soon. Great project, love the twine with the keys. Thanks so much for sharing on craft schooling Sunday! What a great idea! I love old skeleton keys and windchimes. 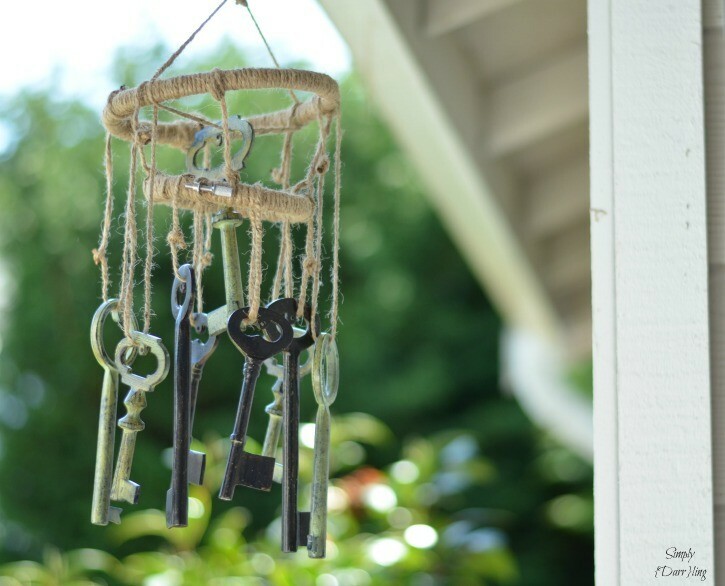 Very cute idea and clever skeleton key repurpose! so unique.Love this. Thank you for linking with us at #HomeMattersParty. We would love to have you again next week. I wouldn’t know what the heck to do with them! But now I would. I love this. So creative. Thanks for linking up at #SaucySaturdays. 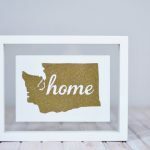 Oh this is so cool and fun, our To grandma’s house we go link party starts over at our place tomorrow morning, would love to see you there! Clever idea, I bet it sounds great! Thank you for sharing on Merry Monday! Hope to see ya next week! What a darling wind chime!! I love this. This is such a neat idea! Looks relatively easy to make too. :) Visiting from This Is How We Roll link up.